In recent years, Cinnabon has become a brand known for stylized photos and pithy tweets concerning cinnamon rolls on Twitter, tweeting more than 95,000 times since 2009. Now it hopes to build on that social success with a teen-focused Snapchat video endeavor. 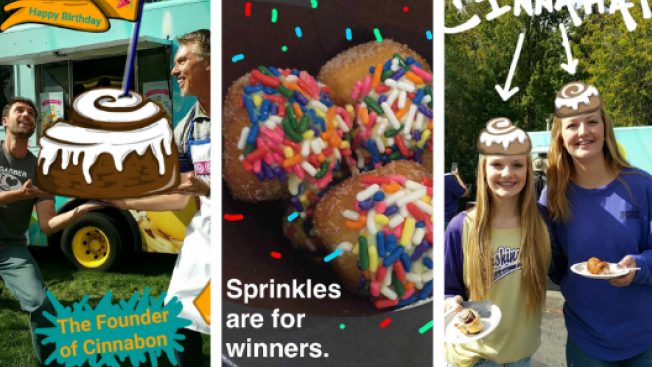 This week, the bakery chain is running its first Snapchat effort to celebrate its 30th birthday. It's not buying Snapchat ads, hoping to leverage its Twitter account (100,000 followers) and Facebook page (1 million fans) to generate buzz for its snaps. Cinnabon is particularly leaning on Twitter, where it changed its profile picture to an image that combines one of its cinnamon rolls and the Snapchat logo. "We have to use the channels that we have access to," said Jill Thomas, vp of marketing at Cinnabon. "We have a very loyal and engaged following on Twitter." To help build a dialogue with teens going into the new effort, the brand hired two popular Snapchat creators—Danny Berk and Evan Garber—to take over its account and then ask fans to submit pictures of sweets last week. Within a couple of days, the brand gained 2,000 Snapchat followers. On Saturday, Berk and Garber posted a two-minute Snapchat Story made up of short clips from a tailgating event for a University of Washington football game in Seattle, where they passed out free cinnamon rolls. The duo also reposted the best pictures from fans. "We want to mix up the content up more and bring people into the moment a little bit more," Thomas said. Similar events will continue this week across the country, as part of a campaign that also includes giving out free miniature buns at bakeries. In terms of messaging, Thomas said, the Snapchat play addresses teens who don't have the same brand-based memories as adults, who may recall the fresh-baked-bread smell that has often wafted through shopping malls in recent decades. Instead, young folks today may know Cinnabon from products sold at Taco Bell and Burger King. "One of our concerns was, 'How do we stay connected to an audience whose memories are not coming from the same, personal memories that many have had?'" Thomas said. "I loved the idea that [Snapchat] was very one-to-one and personal."